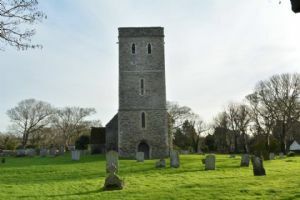 The ancient church stands in a lovely setting on the Western edge of the village, its tower clearly visible from many different points throughout the parish, a solid reminder of the presence of God in our midst. Some may think a "Church Service" off-putting or irrelevant, so what happens in it? We give thanks for the blessings we enjoy; we recall our failures and confidently ask God's forgiveness; We hear his Word, both read to us and explained, helping us to find meaning and purpose in life; We sing hymns, both old and new; We pray for our local community and the wider World, for those in sickness or need and we remember before God the departed. 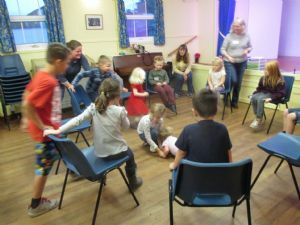 At Holy Communion, following the command of Jesus, we share bread and wine in a symbolic meal which, like other celebratory meals, expresses our fellowship with God and with one another. Nothing detached or irrelevant in all that! We enjoy our time in church, and we would like you to enjoy it as well! We have an annual Open Gardens and join with the other 3 churches in our Benefice for the Wantsum Group Rogation Walk annually. 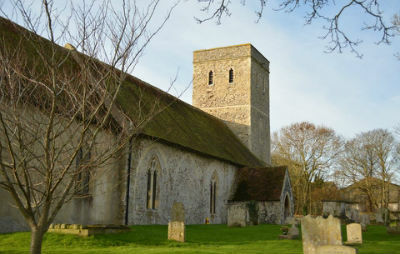 The church dates from pre Domesday times when it appears in the Domesday Survey of 1086, and is the smallest of the seven remaining ancient churches in Thanet. The present church dates from circa 1190 and was extensively rebuilt in the 15th century, when the north aisle was blocked up and new windows inserted. The north porch was also built at this time and the top stage of the tower added. The church which is unbuttressed consists of chancel, nave, porch and tower. The roof is XVth century with king posts and tie beams. The churchyard which is surrounded by stone walls contains many interesting graves and tombstones and is now well maintained by a loyal band of helpers. There is a guide to the church available in the church which lists all the many interesting features to be seen. The church stands at the north west of the village on just about the highest ground within the village confines and is a quintessentially English country church of Norman style.